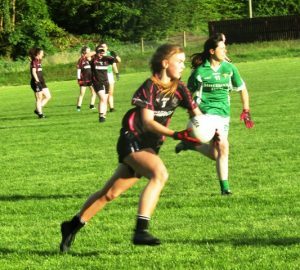 The rain cleared on Wednesday evening as the Walterstown ladies made the trip to Moylagh for the first round of the championship. It was a young Walterstown team taking to the field and a team bereft of some of the regular starters, in fact only six or seven from the 2016 corresponding encounter with Moylagh started the game for Walterstown. Moylagh had the slightly better start notching up the first score, but neither side really stretched ahead as the defences for both side were on top. However 13 minutes in the first goal of the game was registered, from the boot of Mollie Brown. Moylagh responded with two points of their own, before points from Mollie Brown and Edel McGrane before half time saw Walterstown head into the break with a slender 1 point advantage. Moylagh came out flying in the second half, registering four consecutive points, in the opening four minutes. Moylagh were starting to get a hold of the game, but a surging run from Walterstown Kate McCarthy , aided by Edel McGrane saw Kate find the net again for Walterstown, halfway through the second half. Heading into the final few minutes Moylagh had a two point cushion. After a brief downpour of hail stones, Moylagh struck with their first goal on 27minutes, followed two minutes later by their second which secured the win for them. Moylagh is always a tough place to go and win, and the ladies put in a spirited performance and were always in contention until the final few minutes. Next up for the ladies is a home tie against Ballivor on Wednesday 16th May, Throw in time to be confirmed. Walterstown Ladies : 1 – Lisa O Neill , 2 – Sophia Gillooly , 3 – Kate McCarthy (1:00), 4 – Sarah Finnegan, 5 – Eleanor Murchan, 6 – Leanne O Neill, 7 – Anna Frazer, 8 – Antonia Brady, 9 – Edel McGrane (0:01) , 10 – Nadine Swan, 11 – Mollie Brown (1:03), 12 – Aoife Keegan , 13 – Emma Kelly, 14 – Martina O Neill, 15 – Aisling Kelly (0:01).